Manchester United Football Club returned to winning ways yesterday, with a relatively routine 2-1 victory over Everton at Old Trafford. The Red Devils went ahead in the first-half thanks to a penalty scored at the second attempt by Paul Pogba, then when the second 45 just got going, Anthony Martial produced the moment of the match. Our talented Frenchman beautifully curled one around a hapless Jordan Pickford to double United’s advantage. From that point forward, the result never really looked in doubt. Jose Mourinho’s men were always pretty comfortable despite Everton trying to press, but in the end, the better side won. 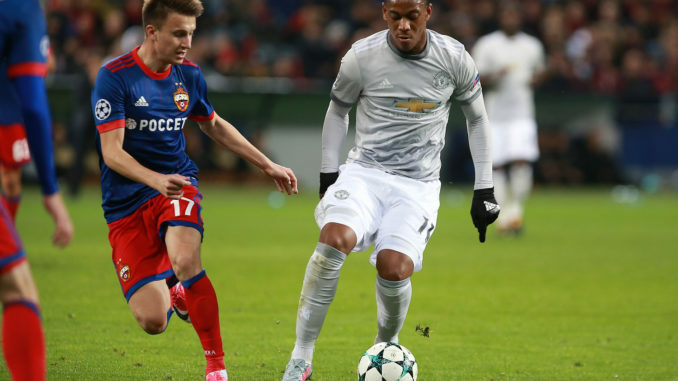 Shortly after, Martial took to Twitter to thank the fans for their continued support. Martial is genuinely our biggest threat right now, he simply has to start every game when he’s in this form. The pace, the on-ball ability, the deadly finishing, this boy has it all. At times last season, we were all left scratching our head when the 23-year-old was consistently benched in favour of an out-of-form Alexis Sanchez. It’s great to see Martial continually proving the doubters wrong with some wonderful performances. Now, all that’s left is for him to sign on the dotted line and commit his long-term future to Old Trafford. Manchester United had a superb month of September in terms of domestic results, with Louis van Gaal’s men even reaching the summit before the demolition away at Arsenal in early October.